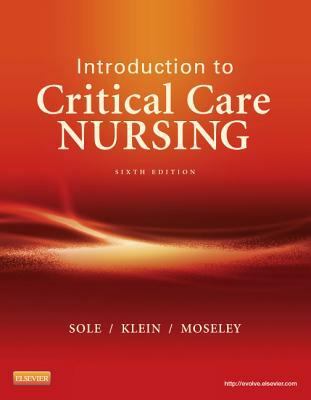 skills.Critical thinking questions in every chapter encourage you to apply the concepts presented throughout the chapter.Evidence-Based Practice boxes illustrate how research and evidence are used to address problems in patient care and their implications for nursing practice. Boxes include the AACN's new system for Level of Evidence: A, B, C, D, E, and M.Nursing care plans provide nursing diagnoses, expected patient outcomes, and interventions with rationales to prepare you for clinical practice.Clinical Alerts promote patient safety and better clinical care by highlighting potential problems and concerns for a variety of settings.Laboratory Alerts discuss both common and cutting-edge tests and procedures, emphasizing the importance of laboratory test results to critical nursing care.Pharmacology tables detail the actions/usage, indications, dosages/routes, side effects, and nursing implications of commonly used critical care drugs.A new chapter on Solid Organ Transplantation provides information on caring for both donors and recipients receiving these increasingly common procedures, emphasizing the commonalities and unique attributes for the various transplantations.Enhanced ECG measurement coverage helps you master this complex area with standardized ECG strips that are 6 seconds long and computer rendered for clarity.An emphasis on QSEN competencies enables you to gain the knowledge, skills, and attitudes needed for providing high-quality, safe health care.NEW! Bariatric Considerations boxes highlight the effects of obesity on critical illness, as well as important safety alerts and interventions for the morbidly obese.NEW! Colorful design includes full-color illustrations that visually clarify key concepts and revised algorithms that use color to enhance your understanding of the latest American Heart Association guidelines.